Jonah Hill hugely impresses in his first-time in the Director’s chair. Ever since I saw Jonah Hill buying a pair of glittery high-heeled boots, and annoying Catherine Keener in Judd Apatow’s The 40-Year Old Virgin, I have been a huge fan of his. His roles in Knocked Up, Superbad, Moneyball, The Wolf Of Wall Street, This Is The End, 21 & 22 Jump Street and most recently Don’t Worry He Won’t Get Far On Foot have only solidified his status to me. Having worked under the likes of Gus Van Stant, Bennett Miller, Martin Scorsese, Quentin Tarantino and of course Apatow, it’s fair to say that Hill has had his own exceptional personal film school, learning first-hand from some of the greats. It seemed only a matter of time then, given his incredible tutors, that Hill himself would turn his hand to directing. Mid90s is his debut, a gritty coming of age story about Stevie (Sunny Suljic) a 13 year old boy growing up in Los Angeles, in the, yep- you guessed it, mid-90s. Despite being close to his Mum, Dabney (Katherine Waterston), Stevie has to endure a rough home-life and is often beaten by his aggressive brother Ian (Lucas Hedges) and a few days after a particular beating, Stevie notices a group of older skater boys messing around outside their store. Stevie shyly starts to integrate himself to the group, befriending the youngest boy Ruben (Gio Galicia), who in turn introduces him to the rest of the gang; Ray (Na-kel Smith), Fuckshit (Olan Prenatt) and Fourth Grade (Ryder McLaughlin). After stealing $80 from his Mum to upgrade his brothers old board, Stevie starts impressing the older boys by attempting dangerous stunts and not being fazed by the resulting injuries. With his new group of friends, Stevie begins to experience a new lease of life, as he starts smoking, drinking, taking drugs and meeting girls at parties. With his new friends encouraging him to try new experiences, Stevie’s home-life becomes even more stifling for him as he realises he has what it takes to stand up for himself. Given Hill’s prowess as one of the best comedy-actors around, you’d expect Mid90s to have it’s fair share of laughs, and it does. There are lots of throwaway ‘stoner chat’ lines and the dialogue in general is sharp and witty. 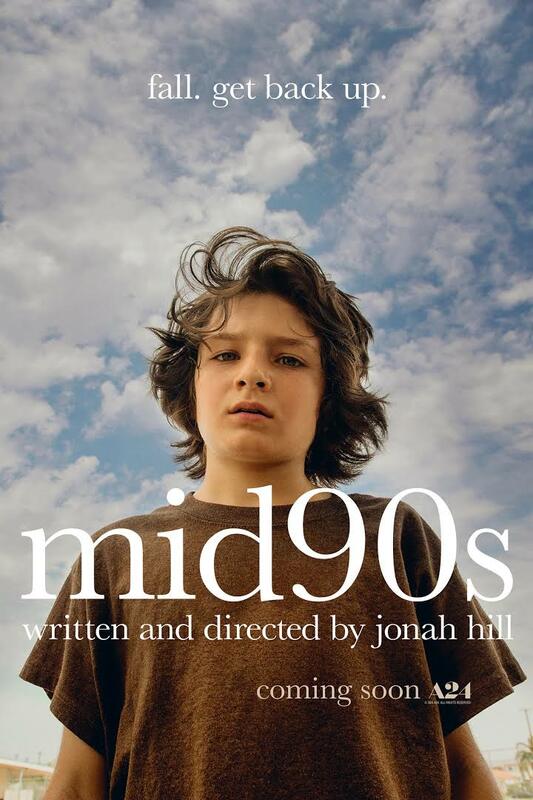 Mid90s itself though, provides much more than just the comedic writing that you come to expect from a script written by Hill. It’s a gritty coming of age drama, that hits you about just as much as a skater falling off their board. In an eery opening, we see Ian beat Stevie around, with still shots of a bland corridor in which a child is harshly beaten providing an early reminder that this isn’t one of the comedies that Hill made his name in. This is just one of many angsty scenes, showing that Hill as a director is willing to make a brave decision to steer away from a genre he’s so comfortable in, but it is one that pays off hugely as the film has a genuinely uneasy feel throughout. There are plenty of happier scenes as well however, with a number of beautiful shots of the boys skating down the main road, accompanied by an amazing soundtrack which, for me, are the highlights of the cinematography on show. The performances are very pleasing to watch. Sunny Suljic stars as Stevie, playing a shy, uncomfortable child at the beginning but completes his story as a seriously cool kid with a lot of baggage perfectly. Na-kel Smith and Olan Prenatt also give really slick performances as Ray and Fuckshit respectively as their friendship is on the verge of imploding due to their differing behaviours and attitude towards skating. There are also strikingly good performances from Katherine Waterston and Lucas Hedges as Dabney and Ian, with Hedges managing to somehow make you feel sorry for him, despite him savagely beating the crap out of a child. The performances match the aesthetic of the film perfectly, with so many 90s throwbacks it’ll make people of a certain age feel both slightly older and nostalgic. Super Nintendo, Teenage Mutant Ninja Turtles bedsheets and music from Nirvana, Morrissey and so many classic 90s Hip-Hop tracks that provide the perfect soundtrack to growing up in LA during the mid-90s. There are a few moments that don’t quite match up to the rest of the film however, with the car scene towards the end of the film a little transparent and the scene where Stevie meets Estee (Alexa Deemie) is slightly overly done, with Nirvana’s My Girl playing in the background pushing it slightly into the cliché category. For a directorial debut for Hill though, Mid90s manages to capture the audience very well and has a real This Is England feel to it, which can’t exactly be a bad thing for your first outing in the directors chair. Mid90s is out in cinemas now.